Just two books this week, but quite wonderful books. Out of print books found in reserve stock while searching for beloved authors. Books that were so exciting to find and books that I am quite sure will sweep me away. I fell in love with Leo Walmsley’s two Cornish-set autobiographical novels, Love in the Sun and Paradise Creek, last year. They were set some years apart and the second book seemed to suggest that there was another book that would tell the story of those missing years. I did a little research, discovered that this was it, and placed my order. It was only recently that I thought to check the catalogue to see if the library could offer anything by Ruby Ferguson. I found that a wise librarian had saved two of the Jill pony books that I loved as a child, and this unknown title. I ordered it, and when it arrived it proved to be that wonderful thing, a childhood memoir. I’m a little concerned that the elder Ruby looking back at her early years dislikes the sea, but her writing is so lovely that I’m prepared to overlook it! It’s always worth checking the library catalogue – there are often lovely books tucked away just waiting to be rediscovered. What did you find in the library this week? Do go and tell Marg! I hope they’re both great! Wonders indeed! 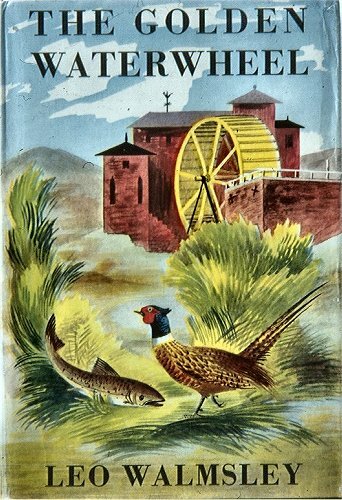 I love the cover for The Golden Waterwheel if only because the fish seems to be floating in mid-air. And who can resist a childhood memoir? (Though I have to say that I’d be instantly suspicious of anyone who dislikes the sea). I picked up a couple of out of print books on Australian history writen by a journalist in the 1970’s. They are unlikely to be reprinted or even digitied but they are nice window into the past, both the time of the writer and the historical period he is referring to. I picked up Shaun Tan’s latest for this weeks loot. Both these books sound lovely. I like to browse the library catalogue…it’s amazing what hidden treasures there are waiting to be discovered. There is such pleasure in digging up gems buried in the library catalogue!